Toledo is one of the most visited cities in Spain by tourists because of its rich history. On this webcam page you can see live video of Toledo as well as pictures and photos of Toledo. 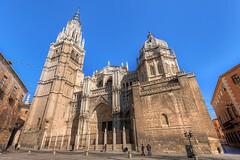 Toledo has so many important tourist attractions that the city of Toledo has been designated a World Heritage City by the United Nations organisation of UNESCO – a prestigious award indeed. Webcams are similar to camcorders in that they are filming and streaming live film of Toledo to websites which you are able to access and view the footage in real-time. Toledo travel and weather webcams are very popular as Toledo is a huge tourist destination in Spain due to its history, famous sights and the fact that Toledo is a daytrip from Madrid so it is very accessible. When you enter Toledo you go across the medieval bridge and through a gateway built into the old stone wall that used to defend Toledo. From this point a visit to Toledo makes you feel you have gone back in time by hundreds of years. As well as many historic buildings, Toledo has many museums. Toledo is also well known for swords due to its historic reputation for making fine swords. 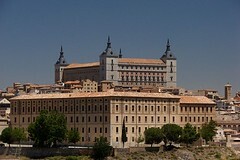 Toledo is located in central Spain only 69km southwest of Madrid so that would be the obvious gateway to access Toledo. Transport and getting to Toledo from Madrid is straightforward as there are many buses, trains and organised tours running daily. Toledo is located in the Spanish province of Toledo, it is the capital and it is situated in the Spanish community of Castilla La Mancha. Toledo has become such a major tourist destination because it was the capital of Spain right until the year 1560. When you visit Toledo you will understand why – the city is located in the centre of Spain and sits on a hilltop making it a great strategic location when it came to defending itself against attackers. Adding to this is the fact Toledo is also mostly surrounded by the river (rio) Tagus. It is difficult to imagine this today in times of conflict but in the city of Toledo there was a mixture of races and religions such as Jews, Arabs, Moors and Christians and in general they lived in relative harmony. Because of this great ethnic mix, Toledo has many different sights and tourist attractions. The Alcazar fortress is perhaps the first thing you notice when you approach Toledo. The four towers are unmistakable. It dates back to the 10th century. As recently as the Spanish Civil War in 1936, the fortress was used for defence and was mainly destroyed and had to be rebuilt. There are two synagogues remaining in Toledo which had a large Jewish population in the Middle Ages these being El Transito (14th century) and Santa Maria la Blanca (12th century). Although the Jews were expelled from Toledo in 1492 much history remains. Toledo cathedral dominates the skyline of Toledo. A true work of art, the cathedral took over two centuries (the 13th to the 15th) to complete! The architecture of the cathedral is a mixture of Gothic, Renaissance and Baroque. 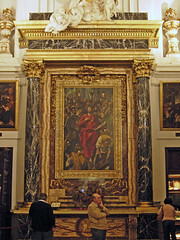 Inside Toledo cathedral are many works of art including works by Velazquez, Goya and El Greco as well as the golden monstrance which is taken outside through Toledo during Corpus Christi. The famous renaissance artist known as El Greco lived in Toledo (he originally came from Crete hence his nickname), many think El Greco was the greatest Spanish painter of the 16th century. All throughout the city you will find works by El Greco. The most famous being ‘ El Entierro del Conde de Orgaz’ which is in the Church of Santo Tome. Below we have a list of our individual Toledo webcam pages. The Toledo webcams below range the major tourist sites of Toledo. The webcam image above comes from the Ayuntamiento of Toledo which has 18 different webcams set up in Toledo. Please help us by suggesting any Toledo webcams that you know of in order to build our list of webcams in Toledo. As well as our webcams showing pictures and images of Toledo we also have an amazing video below showing the most famous sights, best attractions and notable landmarks in Toledo. This video shows the city of Toledo from the air, giving great views of the whole of Toledo. Toledo Webcams – Page Summary – This page contains links to webcams on the historic Spanish city of Toledo as well as videos of Toledo. We show you Toledo webcams so people who have never been can see what Toledo looks like.